Searching for the right stone for your kitchen renovation project just got a lot easier. 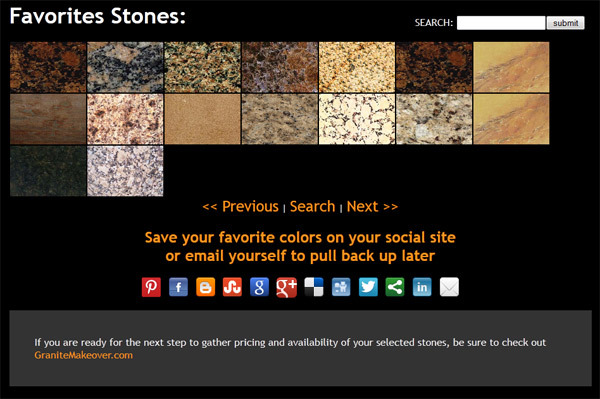 With our new Countertop Color Search Feature you can search for colors by Stone name, Origin, Type, Etc and then you have the ability to create a favorites list. This favorites list will group all the stones that you like together and then you can share this with your social website of choice or email yourself a special like that you can reference these favorite colors anytime. You may even use any one of these 1800+ stones in our virtual kitchen designer to see if that colors goes with your cabinets and wall colors etc. That's quite a selection you have there. Nice work.